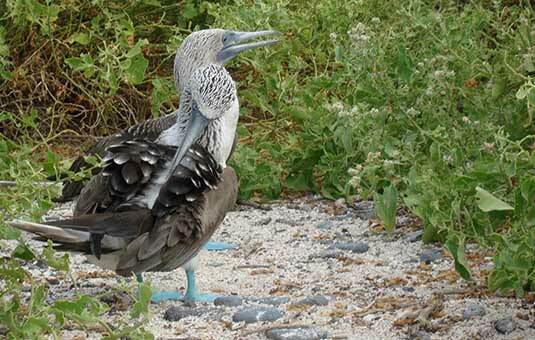 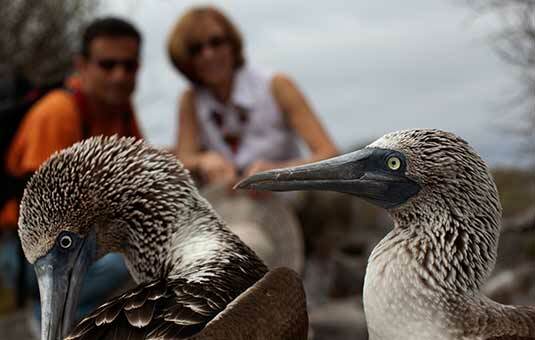 Common and cute, Blue-footed Boobies are the favorite birds of many Galapagos travelers. 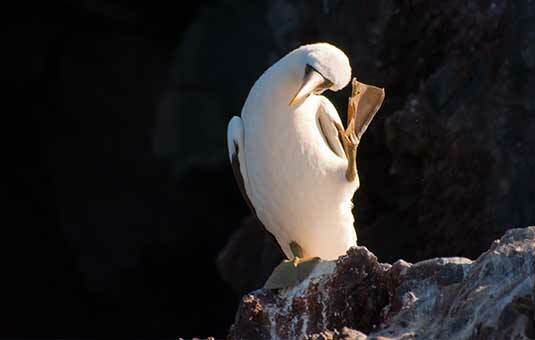 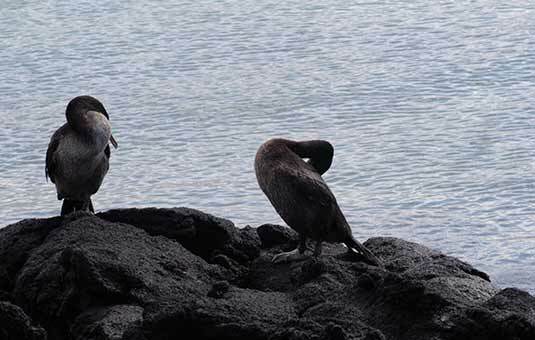 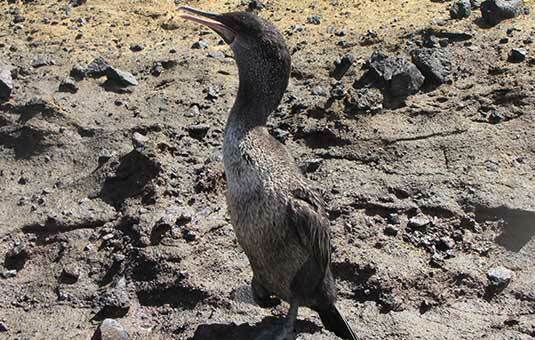 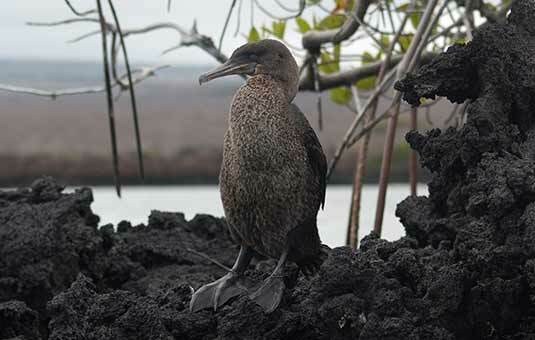 They prefer to nest in any open spot, which often includes the middle of the trail: many Galapagos visitors have had to walk around Boobies who impudently set up their home right on the path! 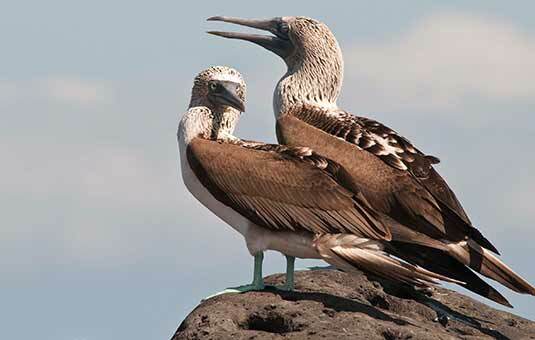 During the booby mating season, male Blue-footed Boobies do a fancy courtship dance complete with lots of hooting, honking and pointing their beaks skyward. 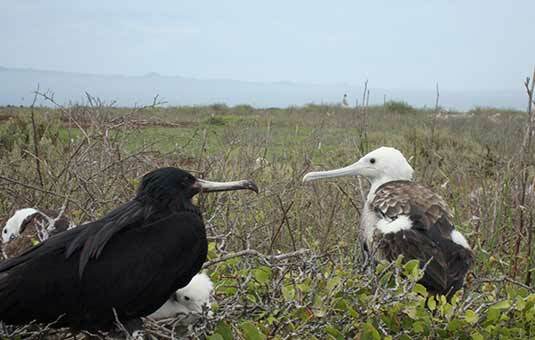 This takes place on different times on different islands, but around March is a good time to see it. 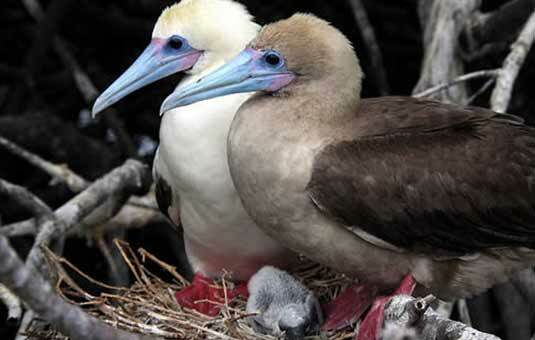 Chicks hatch in June or so and need five to six months of development before they can fly. 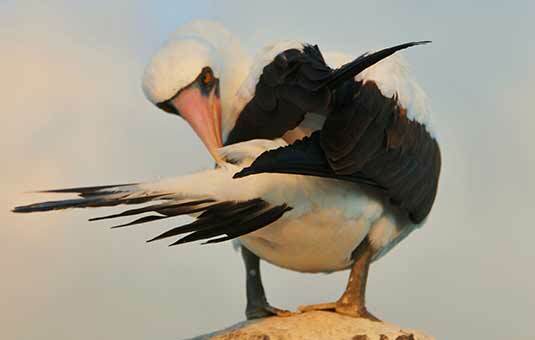 Interesting fact: During mating rituals, male birds show off their feet to prospective mates with a high-stepping strut. 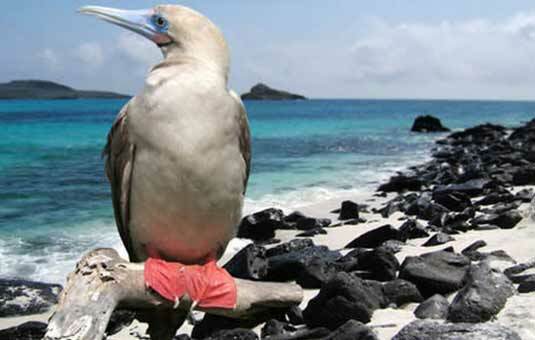 The bluer the feet, the more attractive the mate. 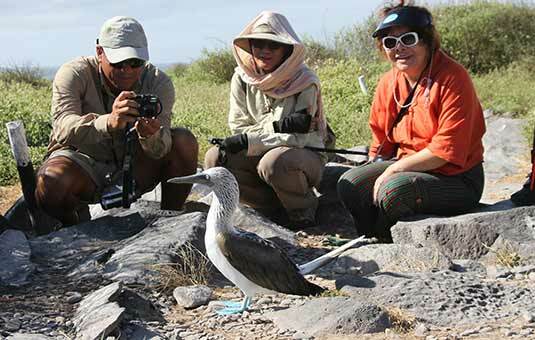 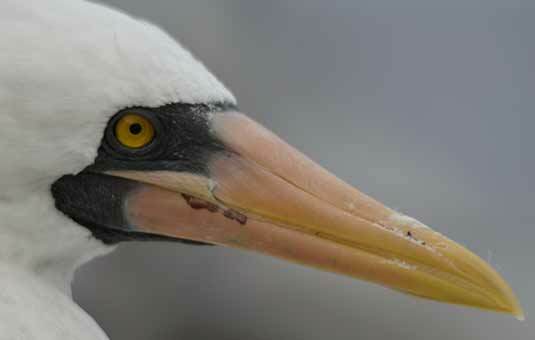 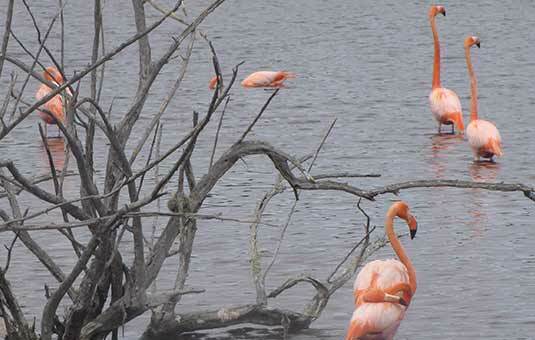 Where is it found: Best nesting colonies in Genovesa, Española and Floreana. 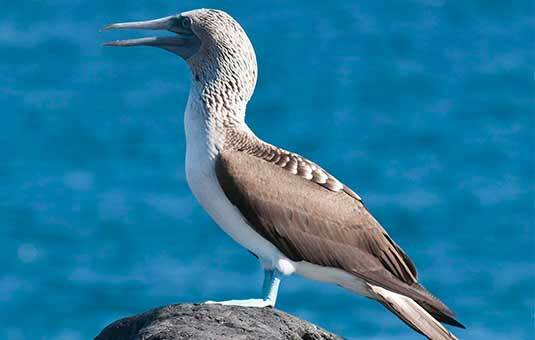 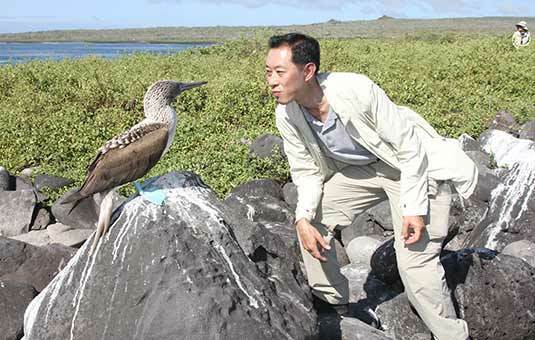 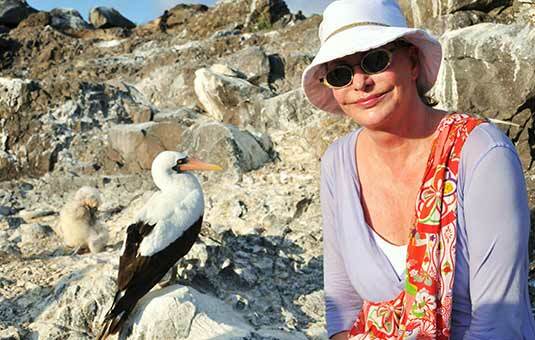 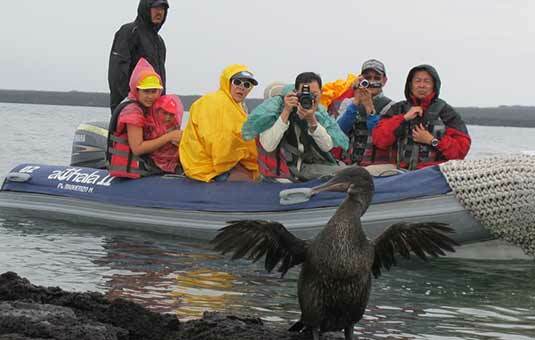 Interesting fact: The largest of the three species of Galapagos boobies. 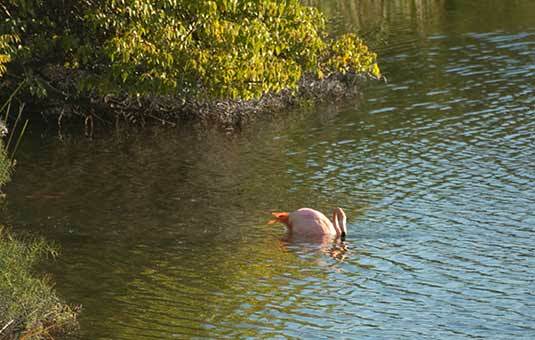 Where is it found: East coast of Fernandina, as well as on the northern and western coasts of Isabela. 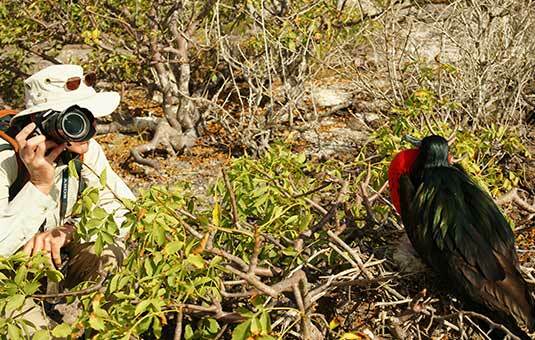 When is it found: All year round. 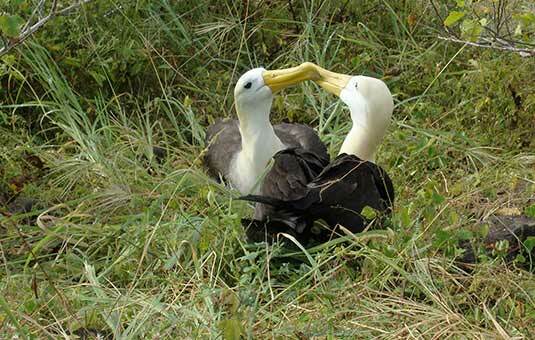 Nesting tends to take place from July to October. 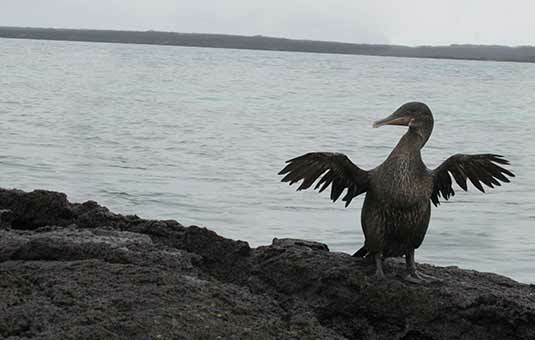 Interesting fact: The only cormorant in the world that has lost the ability to fly. 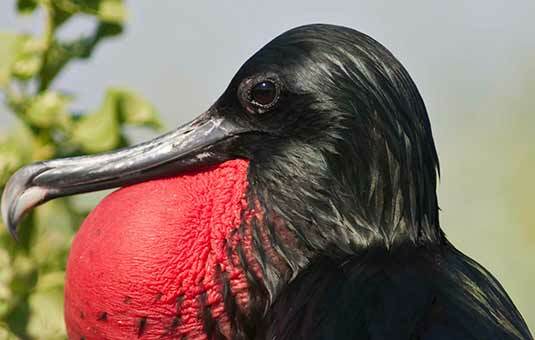 With only 1500 estimated individuals, it is one of the world's rarest birds and is the subject of an active conservation program. 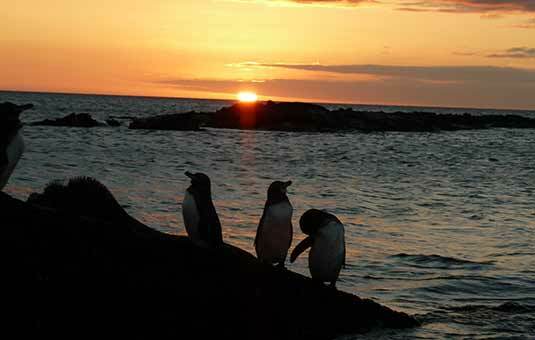 Where is it found: Colonies can be found on Genovesa, Darwin, Wolf, Floreana and Punta Pitt on San Cristobal. 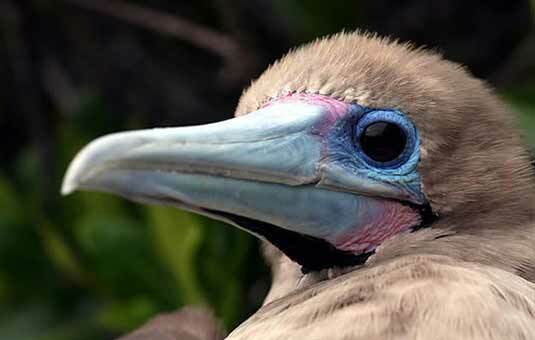 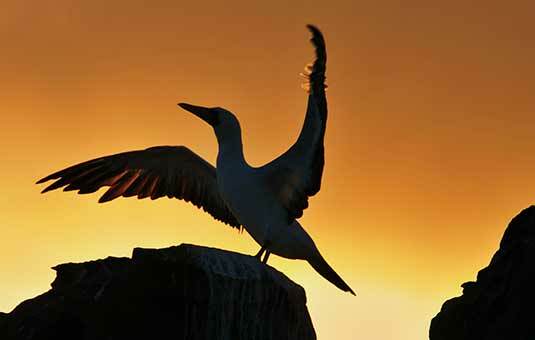 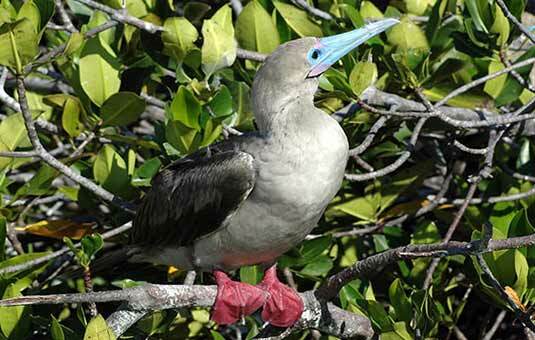 Interesting fact: Red-footed boobies are strong flyers and can travel up to 93 miles in search of food. 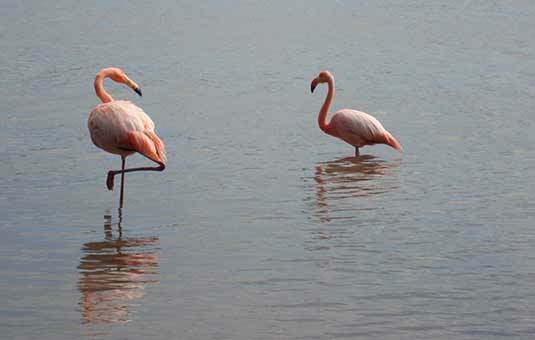 Flamingos are not endemic to Galapagos, but these beautiful pink birds are still a favorite. 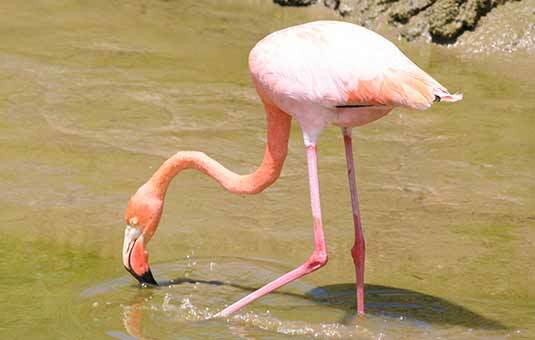 Flamingos eat certain tiny crustaceans that live in brackish salty water. 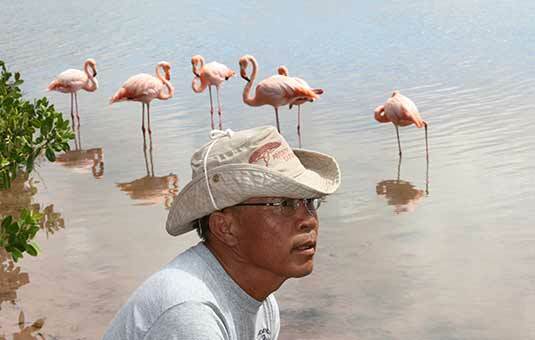 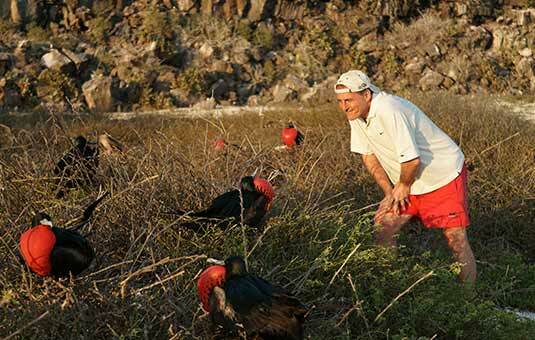 There are only a handful of places in Galapagos that meet the requirements for their very specific food, so there are never more than a few hundred flamingos in Galapagos at any time. 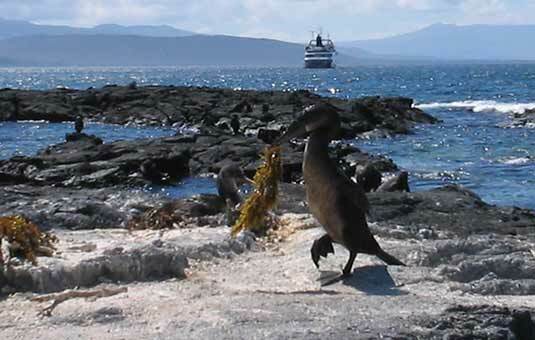 They do nest and breed in the islands, so it is possible to see young ones at certain times of the year. 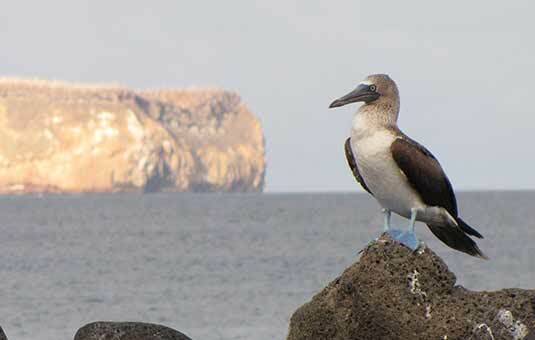 Where is it found: Floreana Island, Isabela Island, Santiago, Rabida Island and Santa Cruz. 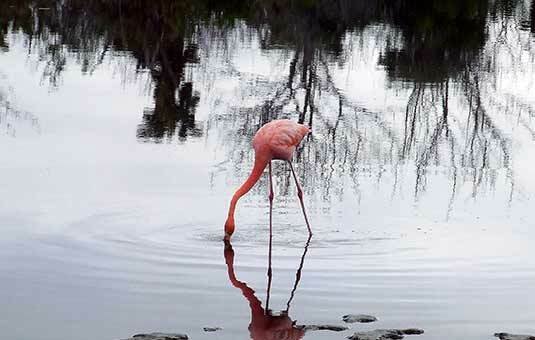 Interesting fact: The Greater Flamingo lives around the brackish waters of some lagoons of Galapagos. 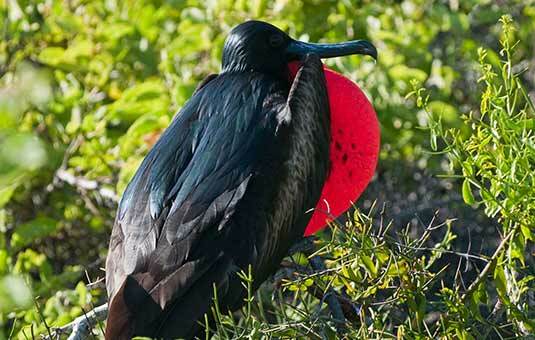 Where is it found: Nesting areas on North Seymour, Floreana, Isabela, Genovesa and San Cristobal. 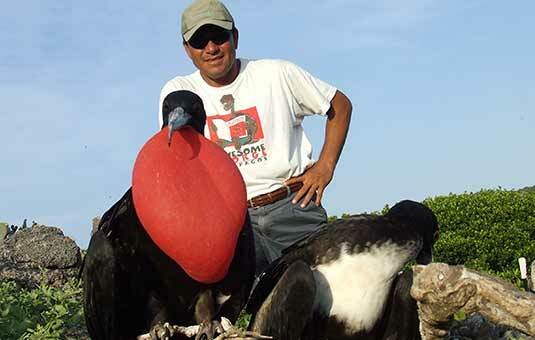 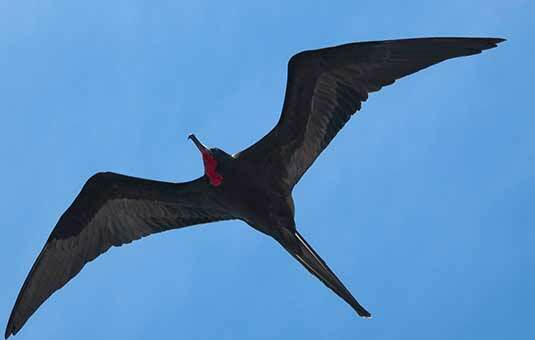 Interesting fact: Great Frigate birds steal food in mid-air from other frigates, as well as other species, like red-footed boobies and tropic birds.. 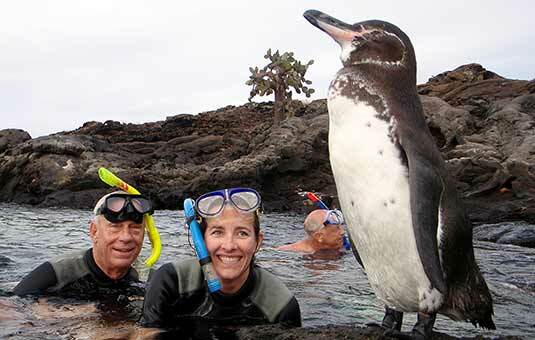 The Galapagos Penguin is truly a remarkable bird. 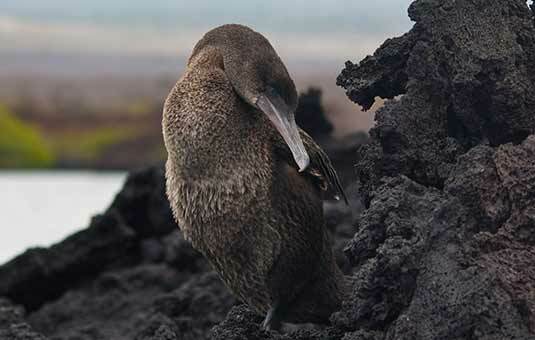 Designed for frigid arctic conditions, it somehow adapted enough to be able to live at the Equator! 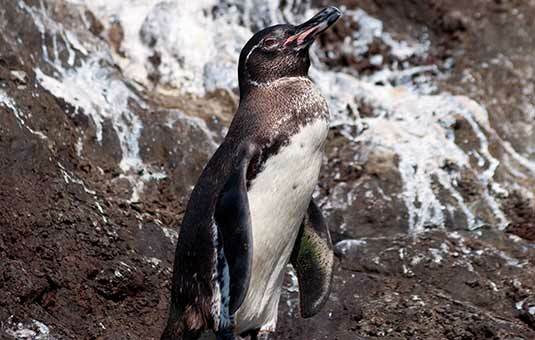 In fact, it's the only penguin to naturally be found north of the Equator. 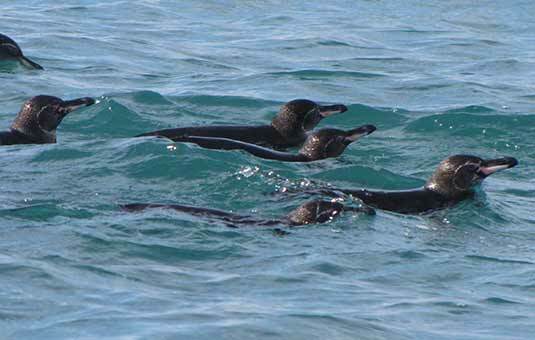 Very fortunate snorkelers will get to see them swimming: they're amazingly quick as they dart around, nipping up small fish! 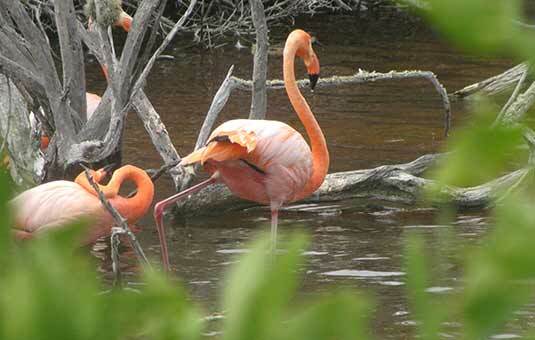 Where is it found: Mainly on Fernandina Island and the west coast of Isabela Island. 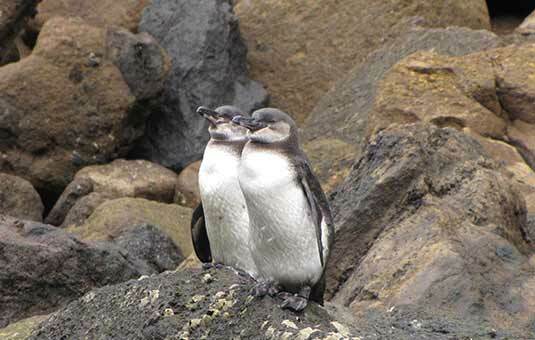 When is it found: All year round. 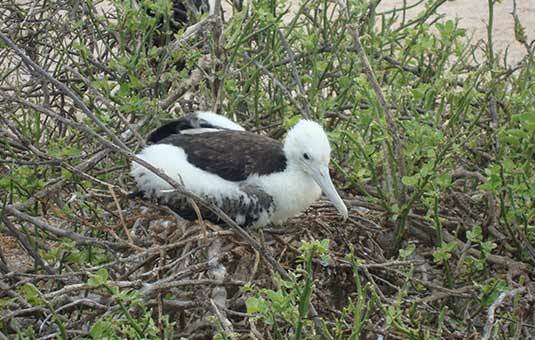 Most nests are seen between May and January. 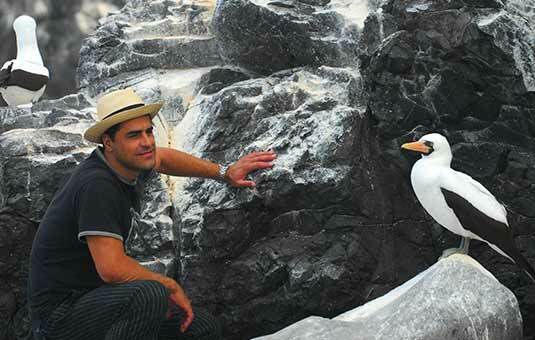 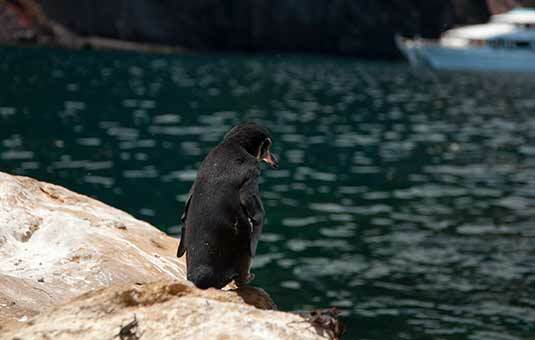 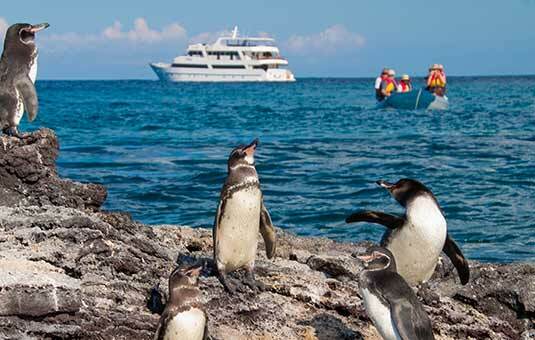 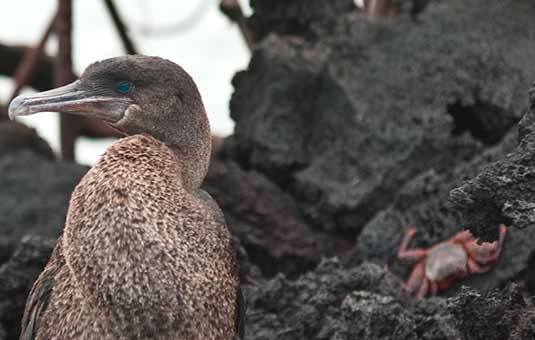 Interesting fact: Endemic to the Galapagos, it is the only penguin that lives north of the equator in the wild. 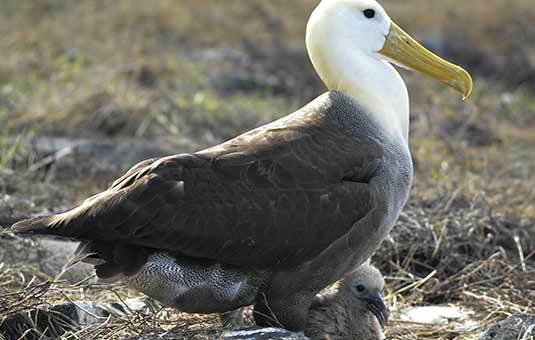 One of the rarest birds in the world, the elegant Waved Albatross only nests in one place: Española Island in Galapagos. 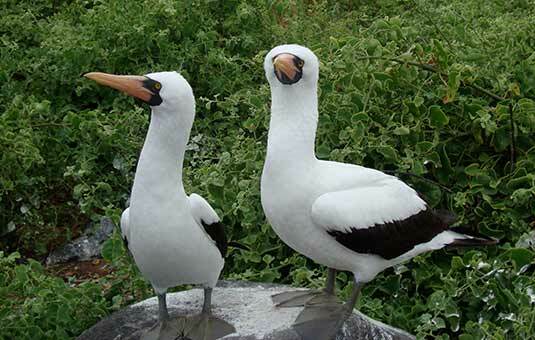 They're handsome birds: their coloring is a blending of brown, yellow and white with a bright yellow bill. 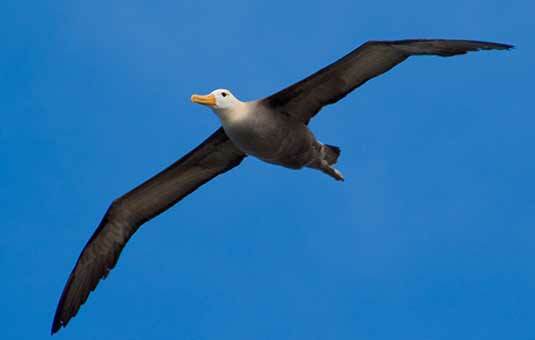 These large birds can fly for days out at sea, scouring the oceans for food such as squid and fish. 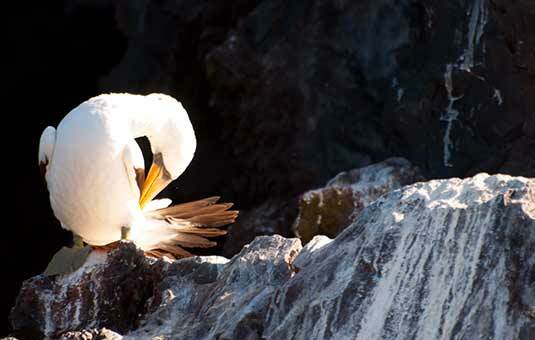 Although they fly very gracefully, they're awkward on land, only managing a sort of weak waddle when walking. 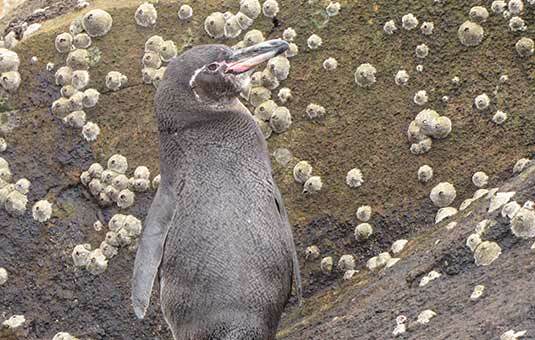 In December, they start to leave: it's the time of year when they feed, bulking up for the months that they'll spend rearing their young. 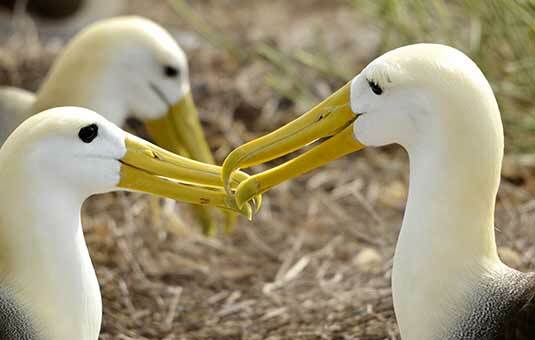 By January they're mostly gone and visitors would be extremely lucky to see one at all until they start to return in April. 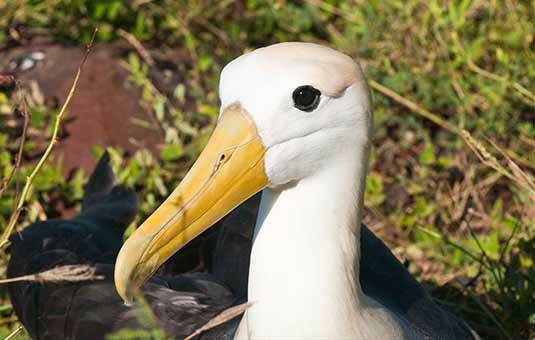 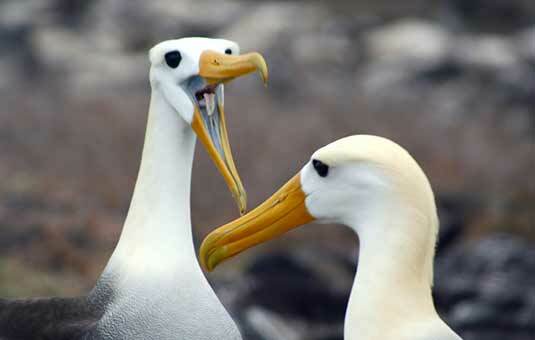 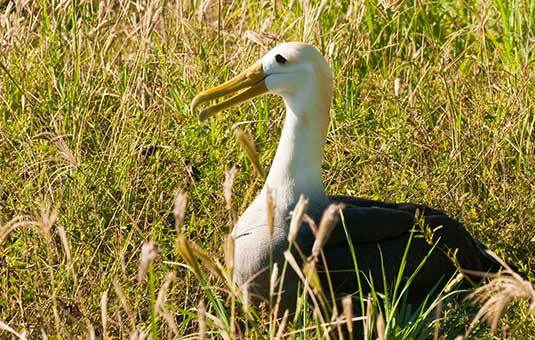 Where is it found: The Waved Albatross breeds primarily on Española Island in the Galapagos archipelago. 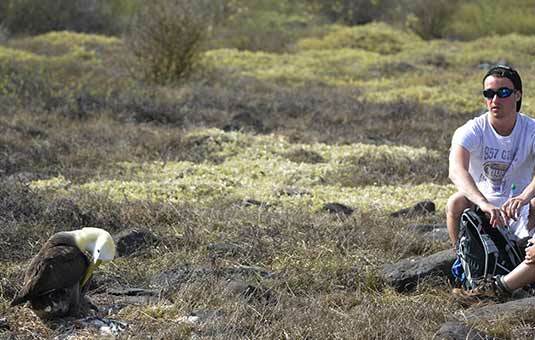 When is it found: All year round. 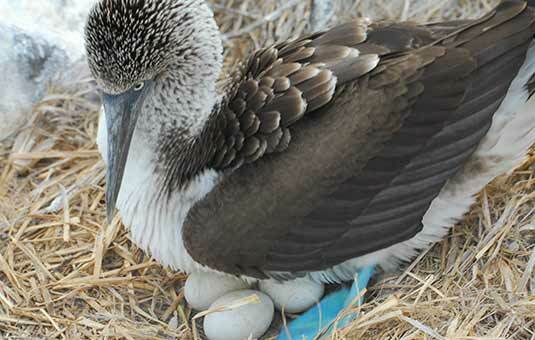 The eggs are laid between April and June. 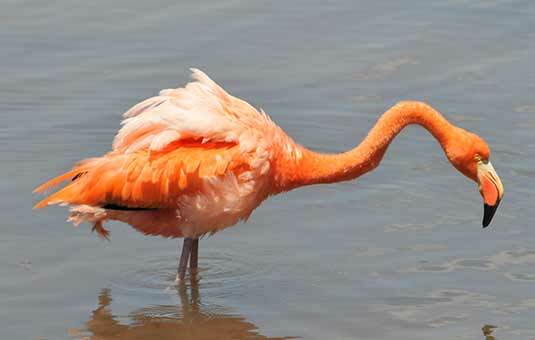 Interesting fact: Derives its name from the wave-like pattern of its feathers on the adult birds.